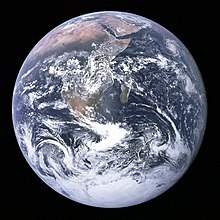 An Earth analog (also referred to as an Earth analogue, Earth twin, or Earth-like planet, though this latter term may refer to any terrestrial planet) is a planet or moon with environmental conditions similar to those found on Earth. The possibility is of particular interest to astrobiologists and astronomers under reasoning that the more similar a planet is to Earth, the more likely it is to be capable of sustaining complex extraterrestrial life. As such, it has long been speculated and the subject expressed in science, philosophy, science fiction and popular culture. Advocates of space colonization have long sought an Earth analog as a "second home", while advocates for space and survival would regard such a planet as a potential "new home" for humankind. Before the scientific search for and study of extrasolar planets, the possibility was argued through philosophy and science fiction. The mediocrity principle suggests that planets like Earth should be common in the universe, while the Rare Earth hypothesis suggests that they are extremely rare. The thousands of exoplanetary star systems discovered so far are profoundly different from our solar system, supporting the Rare Earth hypothesis. Philosophers have pointed out that the size of the universe is such that a near-identical planet must exist somewhere. In the far future, technology may be used by humans to artificially produce an Earth analog by terraforming. The multiverse theory suggests that an Earth analog could exist in another universe or even be another version of the Earth itself in a parallel universe. Likewise, until the 1960s, Venus was believed by many, including some scientists, to be a warmer version of Earth with a thick atmosphere and either hot and dusty or humid with water clouds and oceans. Venus in fiction was often portrayed as having similarities to Earth and many speculated about Venusian civilization. These beliefs were dispelled in the 1960s as the first space probes gathered more accurate scientific data on the planet and found that Venus is a very hot world with the surface temperature around 462 °C (864 °F) under an acidic atmosphere with a surface pressure of 9.2 MPa (1,330 psi). From 2004, Cassini–Huygens began to reveal Saturn's moon Titan to be one of the most Earth-like worlds outside of the habitable zone. 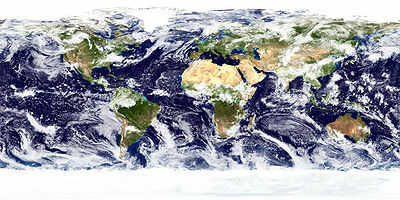 Though having a dramatically different chemical makeup, discoveries such as the confirmation of Titanian lakes, rivers and fluvial processes in 2007, advanced comparisons to Earth. Further observations, including weather phenomena, have aided the understanding of geological processes that may operate on Earth-like planets. The Kepler space telescope began observing the transits of potential terrestrial planets in the habitable zone from 2011. Though the technology provided a more effective means for detecting and confirming planets, it was unable to conclude definitively how Earth-like the candidate planets actually are. In 2013, several Kepler candidates less than 1.5 Earth radii were confirmed orbiting in the habitable zone of stars. It was not until 2015 that the first near-Earth sized candidate orbiting a solar candidate, Kepler-452b, was announced. Kepler-186f 1.1 Orbits in the habitable zone. This comparison indicates that size alone is a poor measure, particularly in terms of habitability. Temperature must also be considered as Venus and the planets of Alpha Centauri B (discovered in 2012), Kepler-20 (discovered in 2011), COROT-7 (discovered in 2009) and the three planets of Kepler-42 (all discovered in 2011) are very hot, and Mars, Ganymede and Titan are frigid worlds, resulting also in wide variety of surface and atmospheric conditions. The masses of the Solar System's moons are a tiny fraction of that of Earth whereas the masses of extrasolar planets are very difficult to accurately measure. However discoveries of Earth-sized terrestrial planets are important as they may indicate the probable frequency and distribution of Earth-like planets. Some argue that a true Earth analog must not only have a similar position of its planetary system but also orbit a solar analog and have a near circular orbit such that it remains continually habitable like Earth. In 2011 NASA's Jet Propulsion Laboratory (JPL) and based on observations from the Kepler Mission is that about 1.4% to 2.7% of all Sun-like stars are expected to have Earth-size planets within the habitable zones of their stars. This means there could be two billion of them in the Milky Way galaxy alone, and assuming that all galaxies have a similar number as the Milky Way, in the 50 billion galaxies in the observable universe, there may be as many as a hundred quintillion. This would correspond to around 20 earth analogs per square centimeter of the Earth. Terraforming (literally, "Earth-shaping") of a planet, moon, or other body is the hypothetical process of deliberately modifying its atmosphere, temperature, surface topography or ecosystems to be similar to those of Earth to make it habitable to humans. ^ a b Overbye, Dennis (November 4, 2013). "Far-Off Planets Like the Earth Dot the Galaxy". The New York Times. Retrieved November 5, 2013. ^ a b c Petigura, Eric A.; Howard, Andrew W.; Marcy, Geoffrey W. (October 31, 2013). "Prevalence of Earth-size planets orbiting Sun-like stars". Proceedings of the National Academy of Sciences of the United States of America. 110 (48): 19273. arXiv:1311.6806. Bibcode:2013PNAS..11019273P. doi:10.1073/pnas.1319909110. PMC 3845182. PMID 24191033. Retrieved November 5, 2013. ^ Brown, Mark (21 November 2011). "Exoplanet hunters propose system to find life-supporting worlds". Wired Science. Archived from the original on 2015-09-25. Retrieved 2015-09-18. ^ "HEC: Data of Potentially Habitable Worlds". Planetary Habitability Laboratory. University of Puerto Rico. January 13, 2016. Retrieved 2016-03-13. ^ O'Gallagher, J.J.; Simpson, J.A. (September 10, 1965). "Search for Trapped Electrons and a Magnetic Moment at Mars by Mariner IV". Science, New Series. 149 (3689): 1233–1239. Bibcode:1965Sci...149.1233O. doi:10.1126/science.149.3689.1233. PMID 17747452. ^ Smith, Edward J.; Davis Jr., Leverett; Coleman Jr., Paul J.; Jones, Douglas E. (September 10, 1965). "Magnetic Field Measurements Near Mars". Science, New Series. 149 (3689): 1241–1242. Bibcode:1965Sci...149.1241S. doi:10.1126/science.149.3689.1241. PMID 17747454. ^ Leighton, Robert B.; Murray, Bruce C.; Sharp, Robert P.; Allen, J. Denton; Sloan, Richard K. (August 6, 1965). "Mariner IV Photography of Mars: Initial Results". Science, New Series. 149 (3684): 627–630. Bibcode:1965Sci...149..627L. doi:10.1126/science.149.3684.627. PMID 17747569. ^ Kliore, Arvydas; Cain, Dan L.; Levy, Gerald S.; Eshleman, Von R.; Fjeldbo, Gunnar; Drake, Frank D. (September 10, 1965). "Occultation Experiment: Results of the First Direct Measurement of Mars's Atmosphere and Ionosphere". Science, New Series. 149 (3689): 1243–1248. Bibcode:1965Sci...149.1243K. doi:10.1126/science.149.3689.1243. PMID 17747455. ^ Salisbury, Frank B. (April 6, 1962). "Martian Biology". Science, New Series. 136 (3510): 17–26. Bibcode:1962Sci...136...17S. doi:10.1126/science.136.3510.17. PMID 17779780. ^ a b Hashimoto, G. L.; Roos-Serote, M.; Sugita, S.; Gilmore, M. S.; Kamp, L. W.; Carlson, R. W.; Baines, K. H. (2008). 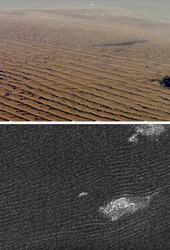 "Felsic highland crust on Venus suggested by Galileo Near-Infrared Mapping Spectrometer data". Journal of Geophysical Research: Planets. 113: E00B24. Bibcode:2008JGRE..113.0B24H. doi:10.1029/2008JE003134. ^ "Cassini Reveals Titan's Xanadu Region To Be An Earth-Like Land". Science Daily. July 23, 2006. Retrieved 2007-08-27. ^ "Seeing, touching and smelling the extraordinarily Earth-like world of Titan". ESA News, European Space Agency. January 21, 2005. Retrieved 2005-03-28. ^ "Cassini-Huygens: News". Saturn.jpl.nasa.gov. Archived from the original on 2008-05-08. Retrieved 2011-08-20. ^ "NASA – NASA's Kepler Confirms Its First Planet in Habitable Zone of Sun-like Star". NASA Press Release. Retrieved 6 December 2011. ^ Howell, Elizabeth; November 14, Space com Contributor; ET, 2017 09:48pm. 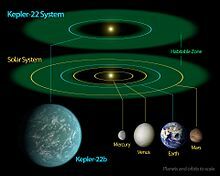 "Kepler-22b: Facts About Exoplanet in Habitable Zone". Space.com. ^ Petigura, E. A.; Howard, A. W.; Marcy, G. W. (2013). "Prevalence of Earth-size planets orbiting Sun-like stars". Proceedings of the National Academy of Sciences. 110 (48): 19273–19278. arXiv:1311.6806. Bibcode:2013PNAS..11019273P. doi:10.1073/pnas.1319909110. ISSN 0027-8424. PMC 3845182. PMID 24191033. ^ "NASA telescope discovers Earth-like planet in star's 'habitable zone". BNO News. 23 July 2015. Retrieved 23 July 2015. ^ a b c NASA Staff (20 December 2011). "Kepler: A Search For Habitable Planets – Kepler-20e". NASA. Retrieved 2011-12-23. ^ a b c NASA Staff (20 December 2011). "Kepler: A Search For Habitable Planets – Kepler-20f". NASA. Retrieved 2011-12-23. ^ Erkaev, N.V.; Lammer, H.; Elkins-Tanton, L.T. ; Stökl, A.; Odert, P.; Marcq, E.; Dorfi, E.A. ; Kislyakova, K.G. ; Kulikov, Yu.N. ; Leitzinger, M.; Güdel, M. (2014). "Escape of the martian protoatmosphere and initial water inventory". Planetary and Space Science. 98: 106–119. arXiv:1308.0190. Bibcode:2014P&SS...98..106E. doi:10.1016/j.pss.2013.09.008. ISSN 0032-0633. PMC 4375622. PMID 25843981. ^ Torres, Guillermo; Fressin, François (2011). "Modeling Kepler transit light curves as false positives: Rejection of blend scenarios for Kepler-9, and validation of Kepler-9d, a super-Earth-size planet in a multiple system" (PDF). Astrophysical Journal. 727 (24): 24. arXiv:1008.4393. Bibcode:2011ApJ...727...24T. doi:10.1088/0004-637X/727/1/24. Archived from the original (PDF) on 5 May 2011. Retrieved 20 March 2011. ^ Johnson, Michele; Harrington, J.D. (17 April 2014). "NASA's Kepler Discovers First Earth-Size Planet In The 'Habitable Zone' of Another Star". NASA. Retrieved 17 April 2014. ^ Johnson, Michele (20 December 2011). "NASA Discovers First Earth-size Planets Beyond Our Solar System". NASA. Retrieved 2011-12-20. ^ Hand, Eric (20 December 2011). "Kepler discovers first Earth-sized exoplanets". Nature. doi:10.1038/nature.2011.9688. ^ "NASA, Mars: Facts & Figures". Retrieved 2010-01-28. ^ Mallama, A.; Wang, D.; Howard, R.A. (2006). "Venus phase function and forward scattering from H2SO4". Icarus. 182 (1): 10–22. Bibcode:2006Icar..182...10M. doi:10.1016/j.icarus.2005.12.014. ^ Clifford, S. M.; Parker, T. J. (2001). "The Evolution of the Martian Hydrosphere: Implications for the Fate of a Primordial Ocean and the Current State of the Northern Plains". Icarus. 154: 40–79. Bibcode:2001Icar..154...40C. doi:10.1006/icar.2001.6671. ^ Villanueva, G.; Mumma, M.; Novak, R.; Käufl, H.; Hartogh, P.; Encrenaz, T.; Tokunaga, A.; Khayat, A.; Smith, M. (2015). "Strong water isotopic anomalies in the martian atmosphere: Probing current and ancient reservoirs". Science. 348 (6231): 218–221. Bibcode:2015Sci...348..218V. doi:10.1126/science.aaa3630. PMID 25745065. ^ "Artist's Concept of Earth-Like Planets in the Future Universe". Retrieved 22 October 2015. ^ "Planet-hunters set for big bounty". 17 February 2008 – via news.bbc.co.uk. ^ "Galaxy may be full of 'Earths,' alien life - CNN.com". www.cnn.com. ^ "Wolfram|Alpha: Making the world's knowledge computable". www.wolframalpha.com. Retrieved 2018-03-19. ^ Robert M. Zubrin (Pioneer Astronautics), Christopher P. McKay. NASA Ames Research Center (c. 1993). "Technological Requirements for Terraforming Mars". ^ Mat Conway (2007-02-27). "Now We're There: Terraforming Mars". Aboutmyplanet.com. Archived from the original on 2011-07-23. Retrieved 2011-08-20. ^ Peter Ahrens. "The Terraformation of Worlds" (PDF). Nexial Quest. Retrieved 2007-10-18. ^ Fogg, Martyn J. (1995). Terraforming: Engineering Planetary Environments. SAE International, Warrendale, PA. ISBN 1-56091-609-5. ^ Birch, Paul (1991). "Terraforming Venus Quickly" (PDF). Journal of the British Interplanetary Society.